Monaco. © Will Pittenger / Creative Commons. McLaren’s Jenson Button and Ferrari-man Fernando Alonso showed their flair when they registered the top times during Thursday’s respective practice sessions at Monte Carlo. Button was the quicker of the pair in a rain interrupted afternoon session – his best of 1:15.746 on Pirelli super-soft tyres gave the 2009 World Champion a four-tenths advantage over Lotus pilot Romain Grosjean. Indeed the conditions played a pivotal part in the framing of the session. With the surface greasy as opposed to wet, many teams concluded the circuit to be too damp for slicks, but not wet enough for wets for much of the running. As the rain fell harder later on, that emphasis changed, with several cars joining the action. With Button running a high fuel run on the super-soft, McLaren offered a brief glimpse into a possible raceday strategy, yet the unpredictable nature of the Monaco track may yet still play havoc with that. The Englishman led the majority of the session, having nabbed the top spot from Sauber’s Kamui Kobayashi; however the greasy conditions prevented further improvements. McLaren teammate Lewis Hamilton grabbed 4th in the morning, but noted later that there was still plenty to learn; however team confidence is – in front of the cameras at least – quite high. Hamilton briefly flirted with the top spot in FP1, only for Grosjean, Sergio Perez (Sauber) and Alonso to vault him. It was Alonso’s best of 1:16.265 that allowed him to jump to the head of the time charts come the end of FP1. There were minor modifications to the F2012, but mainly to help it adapt to Monaco’s unique requirements; however the afternoon weather ensured the red team garnered no laps on the super-soft Pirelli’s. Felipe Massa displayed some confidence boosting pace, ending FP1 in 6th spot, before improving to 3rd in the afternoon; however the Brazilian enjoyed some luck in the morning as he emerged unscathed following a scrap with the barriers at Tabac. Grosjean was a model of consistency for Lotus in practice – the Frenchman finished 2nd in both sessions. The Enstone squad completed several tyre evaluations throughout the day – despite the weather – with Grosjean registering 34 tours of the circuit. However it proved to be an empty morning for Kimi Raikkonen, who completed only an installation lap. Feeling uncomfortable in his E20, the Finn requested a steering column alteration – a change that also demanded a hefty suspension realignment specific to Monte Carlo. The team were delighted to discover their simulated set-ups translated well to the real circuit, bringing to an end a rather interesting week for Lotus*. It was a rather more low key affair for Red Bull, as Sebastian Vettel and Mark Webber coveted mid-table positions. The team lamented the difficult conditions, acknowledging that little had been learned during the 180 minutes of running. Mercedes concentrated on circuit familiarisation and set-up work during the two sessions, although neither Nico Rosberg nor Michael Schumacher ran the super-soft tyre. For the most part, the session proved a positive one for the German squad; however the veteran Schumacher lost a small lump of time, when he broke his front wing on the barriers at the Swimming Pool section toward the end of morning practice. Williams completed minor aerodynamic evaluations, while also concentrating on set-up work and tyre comparisons. 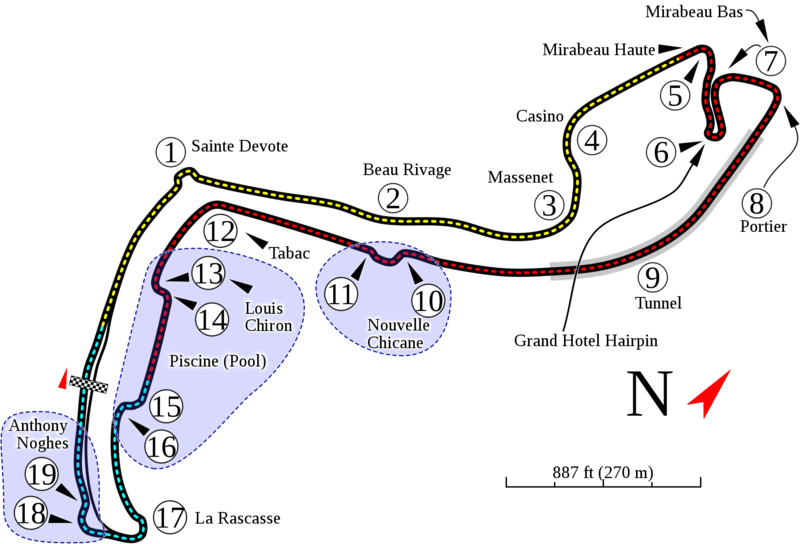 Neither driver would report any significant issues, although both Bruno Senna and Pastor Maldonado endured painless slides down the gripless escape road at Mirabeau. Sauber had little complain about despite the loss of FP2 to the weather. Changes to their brake systems and floor (for Kamui Kobayashi) gave the Swiss team some comfort, without creating headline-breaking news. Force India spent the morning fine-tuning aerodynamic balance and their mechanical set-up on the soft tyre; however the rain halted thoughts of long runs on the super-soft Pirelli; however both Paul di Resta and Nico Hulkenberg were pleased to have garnered some miles on intermediate rubber. Jean-Eric Vergne spent the morning merely acclimatising himself to Monaco in his Toro Rosso STR7. Daniel Ricciardo, too, required time to settle in, having only completed FP1 in 2011 in a Formula 1 car**. The team completed less than the optimum set-up work, much of which was due to be dome in the afternoon. At the back Timo Glock encountered a problem in FP1, when his Marussia suffered from mechanical gremlins – this was made worse by the trying conditions of the afternoon. On the other hand, Charles Pic notched up 37 laps, including some on the Pirelli full wet tyres during FP2. Caterham tried new suspension components; however Heikki Kovalainen brought FP1 to a premature halt when his Renault engine (an old one) blew apart in the tunnel, bringing out the red flag with nine minutes remaining. The Finn also had a harmless off at Mirabeau toward the end of FP2; however his reverse gear failed, ensuring his car could not escape the run-off. As per usual, HRT featured at the rear of the field; however both Pedro de la Rosa and Narain Karthikeyan complete much of their pre-planned programme, including baseline work on upgrades. Apart from the Williams pairing and Kovalainen, there were other offs at Mirabeau toward the end of FP2, including excursions for Massa and Perez. Karthikeyan also went down the escape road in FP1, but survived with no problem. Lotus have been in the news this week. On Thursday, the Enstone squad revealed a new partnership with business technology solutions company Avanade, in a drive to improve Lotus’ technological efficiencies and processes. As an aside, the only two remaining Lotus’ in tomorrow’s Indy 500 field are to start 32nd (Simona de Silvestro, HVM) and 33rd (Jean Alesi, Fan Force United) respectively. Whereas de Silvestro recorded a passable time in qualifying, Alesi’s entry appears to be a worrying 16mph shy of Ryan Briscoe’s pole speed. Although both Toro Rosso drivers will be making their Formula 1 debuts at Monaco, both have raced there previously in the Formula Renault 3.5 series. With two wins for ISR, Ricciardo has shown incredible proficiency on the streets, including two pole positions and a fastest lap on the streets. Vergne’s single visit to the principality with Carlin proved to be less rewarding when he finished a lowly 12th.